Learn intesting facts about all the 50 states! Join Professor Noggin in an exploration of the world of horses. Study horse anatomy and behavior, and learn interesting facts about horse history and popular breeds. A galloping good time! Learn all about this action-packed sport. Learn about the important people who helped shape and lead the United States. Awe inspiring landmarks from every time and culture. Learn about monkeys, rubber plants, jaguars, and more as Professor Noggin takes you from the forest floors of Africa to the canopies of the Amazon Basin. Professor Noggin helps you learn interesting facts about extraordinary women in science, the arts, politics, and more. From Africa to Antarctica, from Asia to America, and from past to present, learn about these trailblazers who discovered not just new lands, but new peoples and new ideas. Learn about the important people and events that have shaped this nation. From inventors and explorers to politicians and athletes, from conflicts and treaties to agriculture and industry this game covers it all. From rural farming communities to urban metropolises, from mountains to tropical islands. Learn about the states, cities, and natural geographical wonders that make this country such an interesting place to explore. Learn about the weird and wonderful human body, from it's muscles to it's senses to its organs. Everything young naturalists need to know about life in the ponds, lakes and rivers of North America. Learn about River Otters, Wood Ducks, Mosquitoes, and Snapping Turtles. (1066-1453 AD) What did the Magna Carta do for us? Who was Joan of Arc? Learn the answers as you travel back in time to a world of knights, battles, castles and cathedrals. Gryphons, basilisks and phoenixes all existed before Harry Potter. Learn about these mythical creatures and explore the science, religious beliefs and cultures that created them. Learn about many of the world's most interesting countries. Identify capital cities, discover interesting facts and learn to recognize countries by their shape. Puppies, kittens, lizards, and turtles are just a few of the popular pets. Discover interesting facts about common pets, and learn about the proper care these pets need from their human parents. From Giant Beavers to Woolly Rhinos, discover the land of prehistoric beasts. Learn about the fascinating fauna that once roamed the earth and swam the seas. From the First Peoples of North America to Pierre trudeau, from the CPR to the Great Depression, this game is a snapshot of Canadian history. This game is an educational experience in the world's second largest country. Learn about the provinces and terrirtories, cities and natural wonders that make this country great! America’s National Parks are the country’s most prized treasures and host millions of visitors every year. Learn about these parks, the wildlife they protect, and even park safety. A game about a little revolt that grew into the revolution that created our nation. Learn about traitors and heroes, famous battles, influential politicians and the ramifications of the war. Learn about the war that had countrymen fighting countrymen. What caused the war? What were the most important battles? How did it end? Learn the answers to these questions and more! Learn about volcanoes, thunderstorms and the crust of the earth as Professor Noggin tests your knowledge of Earth Science. Take a globe-trotting expedition to discover the most exciting animals in the world. The trersity of wildlife is tremendous in this game about the wonders of the natural world. Slimy and scaly is what this game is all about. Topics include poisonous frogs, weird lizards, sea turtles and endangered reptiles. Have you ever found yourself asking, "How was that invented?" Wonder no more! 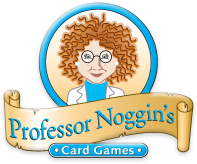 Professor Noggin has developed an inspirational game that covers the world's most famous inventions. Think you know your science? Perhaps the Professor can stump you. This game delves into all aspects of science, including gravity, time, sound, weather and much, much more. Professor Noggin steps back in time to explore lost but not forgotten civilizations. Discover facts about ancient places, philosophers, buildings, arts, clothing, empires and more. Celebrate the rich cultural trersity of North America's First Peoples. Learn about the earliest methods of hunting, farming, art and transportation used by various tribes throughout the continent. Become an expert in geography by learning about many of the world's most interesting countries. Discover interesting facts and learn to recognize countries by their shape. Explore all the things that go on in outer space. Learn fascinating information about planets, moons, spaceships, satellites, asteroids and much more! What is life really like on a farm? Answer questions on everything from fertilizer to farm animals, aquaculture to farm machinery. A fun way to learn about these exceptional creatures from the past. They're all here; Tyrannosaurus Rex, Pterodactyl, Triceratops and many more! Find out interesting facts about common insects and spiders of North America. Discover how many eyes and legs they have, what they eat and where they live. Explore under water and learn about the amazing creatures in the sea. Discover facts about common mammals, plants and other life forms that make the ocean their home.